Germany plans to bring 100 mothballed tanks back into service in what is widely seen as a response to rising tensions with Russia over Ukraine. The tanks were sold to industry as part of defence cuts after the Cold War. 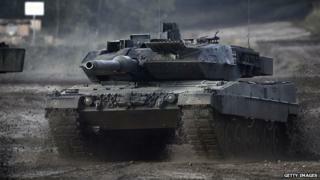 The German defence ministry said it would spend €22m (£16m;$24m) on bringing its total of tanks to 328. Nato officials agreed in February to create a quick-reaction force to meet the challenges posed by the Ukraine crisis and by Islamic extremists. Nato defence ministers have also agreed to more than double the size of the alliance's Response Force. The moves were seen as a signal that Nato regards Russia's seizure of Crimea and its military forays into eastern Ukraine as much more than a temporary crisis. German defence ministry spokesman Jens Flosdorff confirmed a report by Der Spiegel (in German), saying 100 Leopard 2 battle tanks will be bought back from the defence industry, which has kept them in storage. The spokesman said Germany has to ensure that it can deploy troops with the correct equipment to the right place in a short period of time, given the new goals of flexibility and swift reaction times. "This can only succeed if the equipment does not need to be first moved around through the country," Mr Flosdorff said. The tanks will begin to be modernised in 2017. The move partially reverses a decision made four years ago to cut the total number of German tanks from 350 to 225.